Canada’s great Stratford Festival’s 63rd season also celebrates Canada’s 150th birthday. Its dazzling opening week of stunning productions this year consisted of seven major classic works; the later openings this season will feature new and experimental theater. So Shakespeare’s beloved comedy Twelfth Night led off in a typically handsome production elegantly directed by the sovereign Martha Henry, beautifully designed in a somewhat updated period by John Pennoyer and cast with a non-traditional flavor featuring famed expert Shakespeare players. The only problem seemed to me to be a certain refined reticence about flashy comic vulgarity that here consistently stops short of slapstick physical comedy or excessively playful foolishness. And Twelfth Night has tended to triumph in modern productions with vulgar roughhouse clowning between Sir Toby Belch, Andrew Aguecheek, and Feste the clown [later replaced in the fooling by Fabian], and in gaudy foolishness from the dour Malvolio turned silly when he thinks Olivia fancies him. There’s nothing over the top in this Twelfth Night. 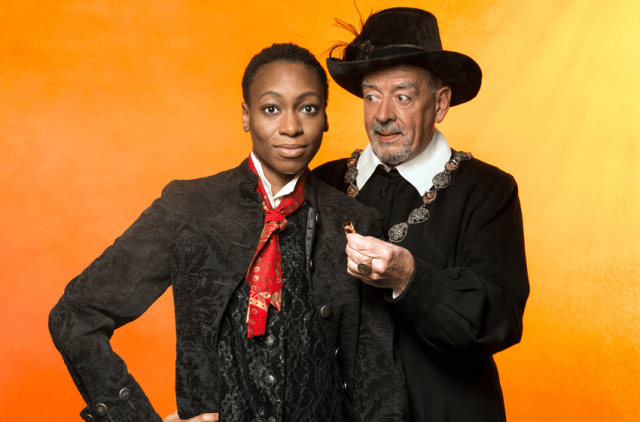 Sara Afful is a beautiful, ladylike Viola with just enough suggested boyishness when she is disguised as Cesario. Michael Blake’s Sebastian is nicely matched to seem a little plausible when we see him confused with his identically dressed sister. His comic bewilderment and delight when Olivia comes on to Sebastian is more effective than his great sadness at the belief that he has lost his sister Viola. I. D. Smith seems a more imperious Duke Orsino than most but rather a low-key love-interest for the disguised Viola. Stephen Russell brings memorable passion to the small role of Antonio. And Lucy Peacock, subtly deglamorized, is a strong, funny Maria, the scheming maidservant. Tom Rooney makes Sir Andrew a truly odd, funny creature. His awkwardness is striking, moreso than Andrew’s usually risible stupidity – less enthusiastic but equally comical. The drunken Sir Toby is usually played broadly and raucously, gaining audience affection and laughs. Geraint Wyn Davies makes him angry and irascible, and unusually impatient with Sir Andrew. He earns his laughs without courting the audience. Shannon Taylor’s Olivia is believable in her various frustrations and affections but isn’t sufficiently compelling. And Rod Beattie’s oddly sympathetic Malvolio is very funny in his drunken-seeming garden scene, but more peculiar and likable than most Malvolios I’ve seen. The only one thing I really dislike in this Twelfth Night is the dull, characterless music. I yield to no one in my admiration for Brent Carver as a comic, acting, musical, dancing talent. In one season this internationally award-winning artist was brilliant at Stratford as a Hamlet and as the Pirate King in The Pirates of Penzance. His clown, Feste, is expectedly winning and amusing and touching. But – though I’ve seen audiences weep at Feste’s concluding “…the rain it raineth every day” and howl with laughter at his comic “catch,” this music is so dreary that none of the songs had any effect at all, except to be tedious.